Recently we carried out research on a family of German colonists which settled in Belowesch (Bilovezhі) nearh Chernihiv (Chernigov). 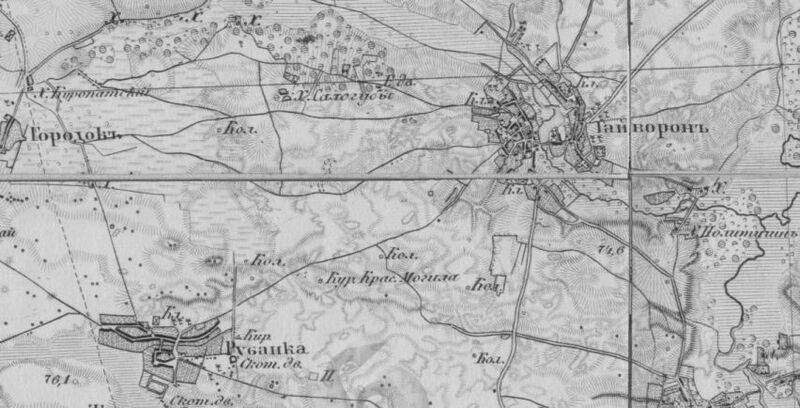 Gorodok (Horodok) near Haivoron, a german collony in Bilovezhi, on a map from 1880. Kaltschinowka (Kalchynivka, Кальчинівка, same name today). The town of Gorodok does not exist anymore, it’s marked on the maps only by the Horodok train station in the middle of forest. In 1951 Gorodok was renamed to Vosmoye Marta (8th of March, Восьмое Марта) and later included in administrative borders of nearby Haivoron. During the research we localized following documents on the colonies and the colonists in State Archives in Chrnihiv, Odessa and Dnipro (Dnipropetrovsk, Yekaterinoslav). Let us know if you’d like to have these records researched.